Indigenous Environmental Network (IEN) teams up with UK Tar Sands Network and Gulf Coast representatives to send clear message to BP shareholders that tar sands is a risky investment. 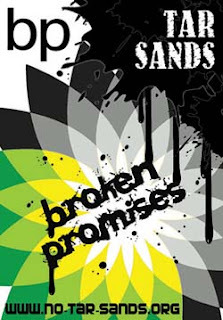 The Indigenous Environmental Network (IEN) has been campaigning for the last two years against BP’s entry into the Canadian Tar Sands. Clayton Thomas-Muller from IEN has traveled to attend BP’s Annual General Meeting on 12th April to submit a statement on behalf of Beaver Lake Cree Nation community members. The statement explains that the legal landscape in Canada is rapidly changing and Aboriginal Rights are increasingly being asserted. This is becoming a powerful barrier to unfettered expansion in the tar sands. In what could prove to be a “constitutional game changer”, the Beaver Lake Cree Nation’s constitutional challenge lists multiple companies including BP, as well as the Canadian federal government and the provincial government of Alberta. “Our constitutionally protected rights are being deliberately ignored and as a Nation we took hold of our inherent rights, stepped up, and challenged the Canadian governments and industry. This has resulted in my First Nation setting a historical legal precedence and that is something BP should not ignore. We want the UK and BP to know that our claim was never about the money, it was never about control, and it’s only ever been about the truth. I am involved in this fight because I have an obligation to my children, my grandchildren, to our old people, to humanity and to the sacredness of our Mother Earth,” said Crystal Lameman, Beaver Lake Cree Nation member and Native rights activist. Beaver Lake Cree Nation has requested an injunction against the provincial government restraining it from approving further extraction projects on their traditional territory, which they claim have destroyed their land and impeded their ability to exercise their Aboriginal harvesting rights. Beaver Lake Cree Nation with the support of IEN is bringing a message to the BP board and shareholders that tar sands is looking like an increasingly risky investment and BP should withdraw from its involvement in this controversial sector. Also attending the AGM will be representatives of the Gulf Coast who will dispel some of the spin around the Deepwater Horizon disaster.